When your dog gets sprayed by a skunk, you need to remove the stink fast. There's one homemade recipe that works far better than others plus a couple commercial products which do a good job as well. While there are different methods of de-skunking mentioned on the Internet, nearly all will prove a waste of your time. The Humane Society of the United States and Village Veterinary both recommend using the following recipe, and MythBusters confirms the combination works better than most methods. Mix these three ingredients together in a bowl to use as the first shampoo. Work the mixture through the fur thoroughly, and use a cloth to wash the dog's face so you don't get the solution in his eyes, ears, nose or mouth. Leave the solution on for four to five minutes and then rinse thoroughly beginning with the dog's head and face. Be aware that peroxide may bleach the dog's fur if you leave it on too long. Shampoo a second time with regular dog shampoo and rinse thoroughly. Towel or blow dry the dog's fur and make sure he remains warm until he's completely dry. You can double this recipe for large dogs. Always mix a fresh batch as needed. Do not store in a closed container. If you prefer to use a commercial skunk odor remover, you may as well choose a product which consistently receives very favorable ratings from numerous customer reviews. Both of the following odor removers come highly recommended. 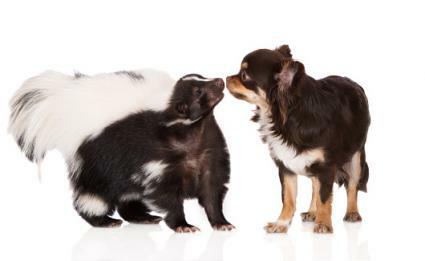 Nature's Miracle Skunk Odor Remover is an enzymatic cleaner and can be used directly on dogs, clothing, bedding and almost anything your pet comes in contact with. The product is applied directly to the dog at full strength, but you must use a cloth to wipe the dog's head and face and take care not to get the product in his eyes, ears, nose or mouth. Customers at Foster and Smith seem very satisfied with this skunk odor remover and rate it at just under five stars. More than 200 Amazon customers also give this product a highly favorable rating. Skunk-Off is also highly rated by over 100 Amazon customers who give it about four and a half out of five stars, and it can be used on pets and materials. For the best results, the manufacturer recommends shampooing the dog with their de-skunking shampoo first and then applying Skunk-Off spray and letting the dog's coat air dry. No matter how well any recipe or commercial odor-removing product works, you may still have to go through the de-skunking process more than once to remove every trace of the skunk's spray. Give your dog a thorough sniff test after your first de-skunking session and reapply your chosen recipe or product to the specific problem areas. With some effort and persistence, your dog will smell like his old self again. If all else fails, you can always take him to a groomer for a haircut.